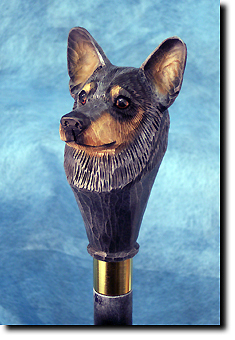 Australian Cattle Dog Walking Stick cast from an original woodcarving of your favorite dog breed. Our Australian Cattle Dog Walking Stick features a hand cast and hand painted Australian Cattle Dog cast head mounted on a solid birch stick with a solid brass collar and rubber tip. They measure approximately 36" in length. Please allow 3 weeks for delivery.